Thinking about buying a bunny for Easter? Unless you are ready for a true commitment, you may want to stick with the chocolate variety. Rabbits may be small, but they require a lot of care and are a big responsibility. If you do decide that you are ready for that commitment, and that a rabbit is the right pet for you and your family, training can help ensure that you have many “hoppy” years together. Rabbits are intelligent and curious animals and, just like any other animal, require exercise and mental stimulation. A bored rabbit can be a destructive and unhappy rabbit. Clicking with your rabbit brightens the rabbit’s life, exercises its lively mind, and can enhance the “human-hare” bond! In their book Getting Started Clicking with Your Rabbit, Joan Orr and Teresa Lewin provides fun tricks and useful behaviors to train your rabbit. Here is a fun lesson for sweet Easter photos! Training this behavior is a great way to get your bunny to pose for cute photos. This trick can also be used to transport pets that do not like to be picked up; it provides an excellent way for children to carry a rabbit safely. 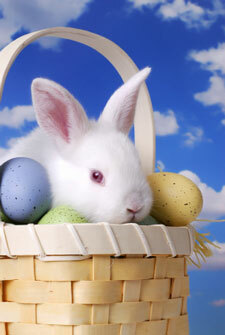 Choose a basket with low sides so your bunny can climb in easily but still be safe being carried. 1. Place the basket near your bunny on the floor of the training area. Click him for sniffing or showing any interest in the basket. Deliver the reward near the basket to encourage him to interact with it. 2. Use a target stick to guide your rabbit into the basket. Once the rabbit is inside, give several small treats in a row. Your rabbit will learn that inside this basket is a great place to be! 3. Add a cue, “Basket,” to get your bunny to climb in the basket. Give the cue, then present your target stick in the middle of the basket to encourage your bunny to climb in. When he starts climbing in, remove the target stick, and click him for four paws in the basket. Again, give several small treats in a row for being inside. 4. Use the verbal cue “Basket,” but don't present the target stick. Click your bunny for four paws in the basket. 5. Teach your bunny to stay in the basket. After he climbs in, wait one second before clicking. 6. Use baby steps to teach your bunny to stay in the basket longer and longer. As you progress, vary the amount of time you ask him to stay. One great way to get longer stays is to give your rabbit something to chew on during the stay. For example, put some hay in the basket. The more comfortable the basket is, the easier it will be to teach your rabbit to stay there. 7. Cue your rabbit to get into the basket. With him in it, lift the basket just a quarter inch. Click if your bunny holds still, and immediately set the basket down again. 8. Use baby steps to increase the height of the lift gradually until you are standing with the basket comfortably. Click when the basket is in the air and your bunny is still. Reward by putting the basket down and giving a treat. 9. Lift your bunny in the basket and take one step. Click if your bunny remains still. Reward by putting the basket down and giving a treat. 10. Use baby steps to increase your rabbit's confidence until you can carry him around in his basket.